Boeing's 737 Max jet has been banned from operating in Irish airspace by the country's aviation authority. The decision comes after an Ethopian Airlines plane crashed on Sunday, killing 157 people on board. It was the second fatal accident involving the 737 Max 8 model in the past five months. The Irish airspace ban means that several flights between Dublin and the United States, operated by the airline Norwegian, have been cancelled. Which airlines use Boeing 737 Max 8? The airline uses Boeing's 737 Max planes on its routes from Dublin Airport to New York Stewart International Airport and to Providence Airport in Rhode Island. The Irish Aviation Authority's (IAA) said it was suspending flights by Boeing's 737 Max "from any operator arriving, departing or overflying" the country's airspace from 15:00 local time on Tuesday. Norwegian's 14:55 departure from Dublin to Providence and its 15:20 flight to Newburgh on Tuesday were cancelled, along with Wednesday's 07:20 arrival from Newburgh. The airline it was reallocating other planes from its fleet to cover routes that its Boeing 737 Max aircraft were due to fly in order to "minimise inconvenience caused for our passengers". "Affected passengers will be informed via SMS and our web pages," added the airline. The decision was made to guarantee the "continued safety of passengers and flight crew, which is the IAA's number one priority", it added. The IAA said that the ban was "precautionary" and it had taken account of the "unprecedented loss of two Boeing 737 Max in recent months". Other countries have also ordered the grounding of the jets, including the UK, France, Germany and China. The UK's Civil Aviation Authority put a ban in place "as a precautionary measure". 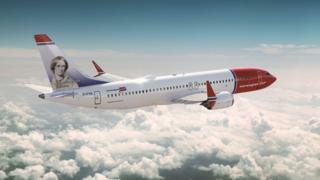 Norweigan said it would not operate any flights using the Boeing's 737 Max "until further notice". Tomas Hesthammer, the airline's chief operating officer, said: "We would like to apologise to customers for any inconvenience caused. "However, safety will always remain our top priority."